It happens every October, millions of children across America on their scariest costumes and going door to door asking for candy. Our houses are swarmed by lots of little ghosts, goblins, Batmen and and Peter Pans. Many of the visitors will be raising money for an organization that funds terrorist and anti-Semitic activities. 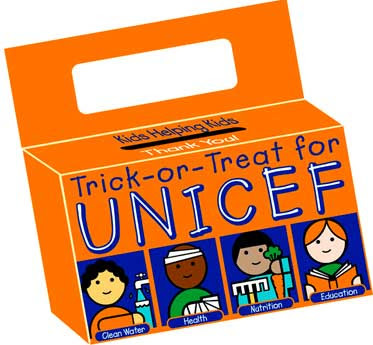 The organization, The United Nations Children's Fund (UNICEF) is best known by the little orange boxes they give the children for use in collecting pennies. What most people don't realize is, some UNICEF money funds projects like Palestinian Summer Camps that train kids to be Homicide Bombers, Production of Anti-Semitic literature, it has written materials praising the oppressive north Korean regime. In short those pennies are being used to support terror and hatred. The ad shows an axe destroying a Star of David. The large Star of David that has been destroyed is decorated with stars and stripes, presumably representing the USA, and an additional smaller Star of David - a common theme in anti-Semitic cartoons that imply Jewish control of the US. On the axe that destroys the Star of David is the word "Boycott!" in the imperative tense. More "love" funded by the United Nations, American Pennies and American Tax Dollars. Disgusting, but I'm not surprised. The U.N. has established itself as the haven for despots, terrorists, and murderers, all the while while symbolically wiping Israel off the map. After all, one can't spell "unethical" without U.N.